This 5 year-old girl was bitten by her family pet dog and sustained scalp laceration and a right red eye. 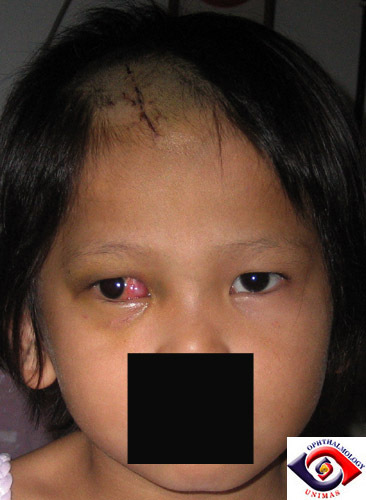 The laceration was sutured in Miri General Hospital and she was seen by the local ophthalmologist who noted a right exotropia (Figure 1). She was referred to the Kuching Sarawak General Hospital for further management. Examination confirmed the presence of a right exotropia with incomplete right adduction (Fuigure 2). Slit-lamp examination revealed laceration of the right medial conjunctiva with exposure of the tenon capsule. Her vision was normal in both eyes and fundoscopy showed no retina injuries. Figure 1. Right exotropia and medial conjunctiva laceration. Figure 2. Full right abduction but incomplete adduction. An urgent MRI scan was requested to assess the status of the medial rectus. However, because of the long waiting time for MRI, a CT scan was performed instead. This showed swelling of the medial rectus near its insertion, otherwise there is no sign of medial rectus disinsertion (Figure 3 and 4). Figure 3. 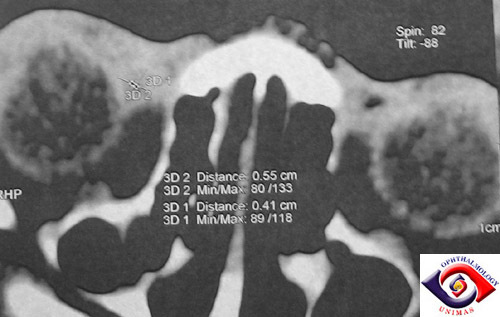 Swelling of the medial rectus on CT scannings. Figure 4. CT reconstruction showed the medial rectus is not disinserted. a. Which is the most common extraocular muscle to be involved in a dog bite?